Brush off that Millennial fatigue. Sure, we see that word thrown around a lot, and we’re inundated with blogs offering tips to communicate or sell to them, but nevertheless, Millennials are taking over the workforce and soon their leadership will steer corporate America. This blog won’t be a diatribe against how entitlement has polluted the workplace or any other jaded attempts to take a stand against one generation and lift up another – this is about how we can embrace today’s leaders and shape them into tomorrow’s legacy. Millennials aren’t kids. These are 30-somethings that have moved into management and are helping shape the way consumers consume and businesses do business. Pew Research Center reports that Millennials make up 1/3 of the current workforce and the U.S. Bureau of Labor Statistics predicts that by 2030, they’ll reach 75%. Raised as children of the eighties and nineties, Generation Y is a product of Baby Boomer parents who were too often placed in “be seen not heard” environments by their Depression/World War II era generation parents, and they refused to raise their children the same way. This “entitlement” mindset replaced the days of “climbing the corporate ladder” to the ongoing pursuit of meaningful work that not only challenges Millennials, but interests them. Gen Y are placing as much importance on developing significant relationships with their peers and their workforce as they are on providing for their family. This has, of course, presented more than a few challenges for their employers. With the urgency to move much of the Millennial workforce into leadership positions, companies are having difficulty retaining their employment. This is the most educated generation in American history (63% have at least a Bachelor’s Degree according to Millennial Branding) and while labels and timetables are being placed on them, they reject cookie-cutter solutions and see employment for what it is – a job. Without the proper training or engagement, they’ll quickly pivot and use their experience and education to find a better one. Or they’ll just start their own business. Millennials want to be connected to purpose. This can be done as an employee or it can be done on the side. Kauffman Foundation reports that 54% of Millennials want to start their own business or already have. If their leaders aren’t excited about their future at that business, why should they be? If hard work isn’t rewarded, why let someone else take all the credit? Rigid restrictions and a catch-all management styles are alienating the workforce and causing the average Millennial to move on after 2 years at the same place according to PayScale, Inc. And while the average cost of $24,000 to replace a Millennial employee may be disconcerting (Microsoft/Experience Study), it takes a backseat to the reality that 63.3% of U.S. executives will retire in the next 5 years (PWC Study). Who will be left to take their place? 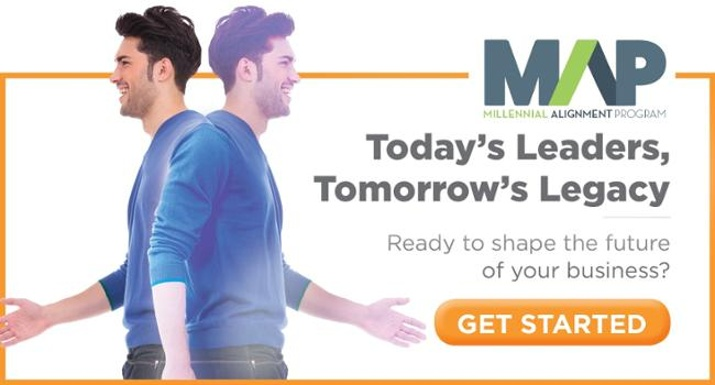 Will your Millennials be ready? This is where organizations must invest in the future of their business and the future of their Millennial workforce. This is where their legacy can be defined. Part of it is creating a company culture they can embrace. This isn’t about entitlement – this is about creating “meaning”. Provide opportunities for them to participate. To create. By opening lines of communication and connecting them to the corporate agenda, you introduce the concept that they are valued. And since meaning is the new money, you offer more than just a line on a pay stub. For a generation that does a lot to prove that they won’t be owned, a paycheck alone won’t retain good employees. The competition can match that. What else are you offering? While ping pong tables in the conference room might appeal to some, we’re talking about Learning and Development. Are you offering an environment where they can grow as a leader and a person? This is what takes leaders to the next level, and you can leverage generational experts to help align your workforce to the Millennial engagement strategies that will shape your future growth and secure your organization’s legacy. CPG has recently introduced the Millennial Alignment Program (MAP). This interactive, 6-month course is a refreshing change of pace from the average corporate leadership training. We lead your leaders (Millennial and otherwise) on an immersive engagement journey that embraces your Millennial workforce. Take a quick quiz to see how aligned your organization already is to Millennial working preferences. MAP takes your entire organization through a proprietary assessment to score score your current Millennial IQ. Then, we create a custom curriculum that will help improve retention and engagement while also establishing a foundation of success for the legacy role Millennials will play at your business… now and in the future.